I pursued B.A. Hons. Jewellery Design and Metal Smithing in Royal Academy of Fine Arts, Antwerp, Belgium. Presently I am pursuing M.A. Jewellery Design in Antwerp. I moved to Antwerp about five years ago. It is hard to not be involved with art when you are in Europe and I took advantage of that. I really discovered myself here and I am still learning and discovering. My college education is more directed to contemporary art and this is how I learned and got interested in contemporary art and jewellery as a whole. I was also attracted to this college because of the freedom given to the students. By freedom I mean choice of style, interest, direction, material, etc. I feel I am too young and fresh to have a signature style. I am exploring all the possibilities at the moment. I like to work with concepts, the rest (material/technique/production) flows accordingly. All of my work until now is self-made. 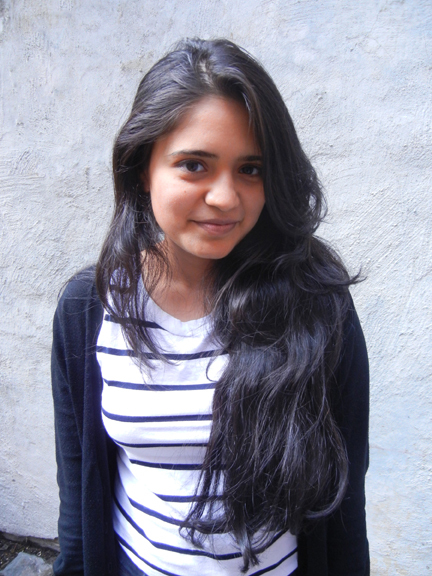 I was born and brought up in India thus I am very fond of our culture and often use it as an inspiration for my work. I have had many valuable experiences in both the cultures (Indian and European), I try to use my personal experiences in my work. With these ‘Memory Brooches’ (featured here), I aim to leave a mark/imprint/memory with the wearer and the surrounding. 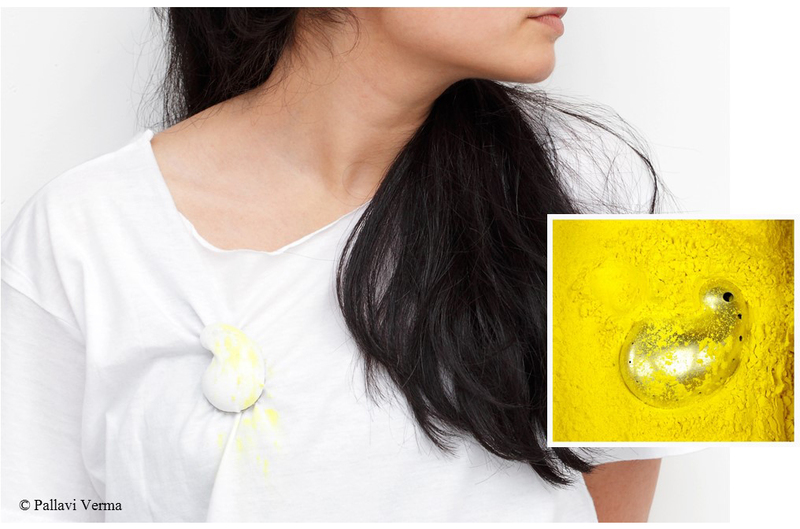 These wearable brooches are colour powder containers. When worn they leave a stain on your clothes with the movement of the body during the day. 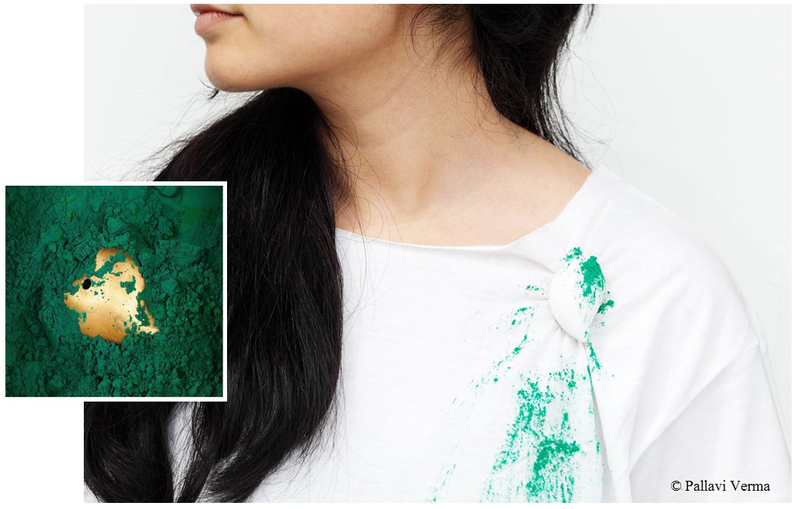 The more you move, the more colour pops up on your clothes. 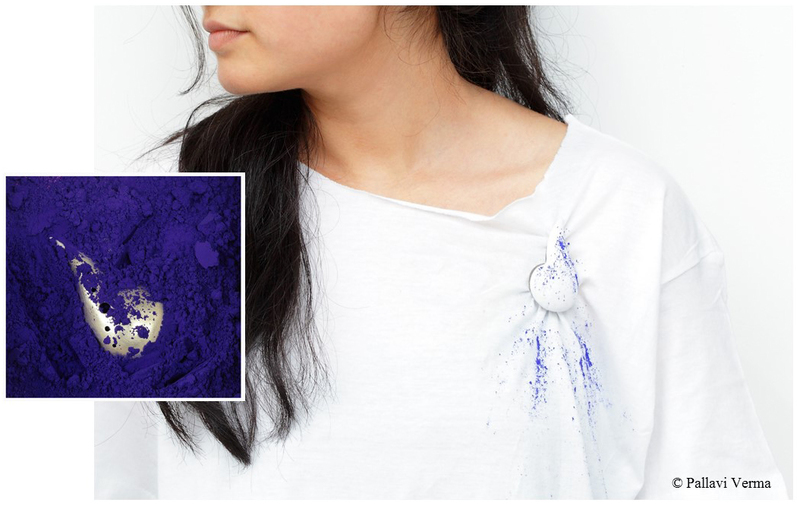 I displayed this work in a few exhibitions as an installation with the brooches submerged in the colour powder. 4. What direction do you see your work taking over the next 5/10 years? With my work I will like to reach out to people more in an artistic way. I think jewellery has a lot of potential and it helps/transforms the way you look at things. 5. 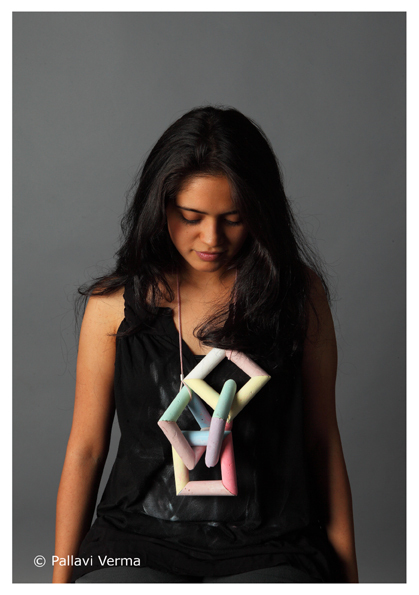 What are your thoughts about the contemporary jewellery field evolving in India? Well, I recently came to know about Project Bawra. I am very glad this effort has been taken to promote contemporary jewellery in India because no doubt we (Indian) have a lot of potential. We just need more awareness. 6. List of publications, projects and exhibitions that you’ve been involved in? – New Tradition Jewellery competition 2014 Nominee, Amsterdam, Holland. 7. Where can one buy your work? I have sold some group projects in my Academy and in Sieraad Fair, Amsterdam. My website is in process now so soon one will be able to see/buy my work online. On the wall: Inspirational pictures and some sketches. In the drive: Personal works, portfolio, CV, inspirational pictures, rhino files, etc. On the shelf: Sketch books/Art books. 11. Anything else that you would like to share about yourself? I enjoy my work and I aim to imprint as many people possible with my jewellery. This entry was posted in art, contemporary, craft, jewellery, studio and tagged art jewellery in india, contemporary jewellery, Pallavi Verma, Project Bawra. Bookmark the permalink.